This is a tour for the beer lover. We’ll combine the unique history of Saint Augustine along with unique Beer History that you can use to amaze your friends. A couple of the places will include appetizer size pairings as well. We’ll show you the best places in Saint Augustine to get the best in premium, craft and locally brewed beer. On this 2.5 – 3 hour all inclusive tour you’ll receive 3-4 tastings at each pub, food pairings at two locations. This tour is available for guests 21 years of age or older. Sorry, we cannot take anyone under the age of 21 on this tour. Please be prepared to show proof of age at each establishment if under the age of 35. This tour ticket includes 3-4 tastings at each pub for a total of nearly 16 beers, food pairings and tips to the servers. An engaging, informative and interactive tour provided by one of our fun and personable guides that are fully licensed by the city of St. Augustine. 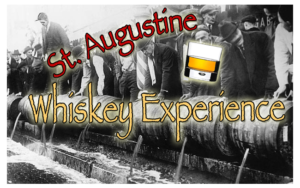 Learn about St Augustine’s sorted past with history of St. Augustine during the time of the Prohibition. This tour is all about the Whiskey! We’ll take you to the best bars for Whiskey Lovers. Different whiskeys will be sampled on this tour: Specialty, Irish, Bourbon, Scotch. For those in the group that do not drink whiskey, you will have the choice of a special martini, well mixed drink or draft beer instead. You’ll get 6-9 total tastes on this one of a kind tour in St. Augustine. There will also be munchies along the way. This tour ticket includes 2-3 tastings at each bar for a total of nearly 9 whiskeys, snacks and tips to the servers. St. Augustine shopping made easy AND FUN! Shop Local & Help a Local Family! Let’s get away from the craziness and confusion of the Big Shopping Malls and Big Box Stores! This tour is not only for the ladies! Guys, this is great for you as well, we’ll help you find some fun and fabulous gifts while you enjoy some fantastic wines here in St. Augustine! Join our shopping expert on this 4 hour all inclusive tour as she takes you to some of St. Augustine’s hidden treasures. Yes, there will be a couple places that are on the main thoroughfare, but most of the places that we will visit will be off the beaten path and very unique. You’ll be able to find something for everyone one your list. AND to top it off, each establishment that we visit has agreed to give you, our guest, an exclusive discount. Don’t worry if you don’t have enough time to shop while on the tour, your discount is good all day, they day of our tour. Just take your shopping card with you when you go back to receive your discount! There will be wine tasting stops along the way as well, to make that shopping experience just a bit more enjoyable. 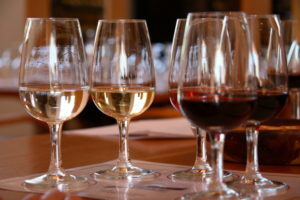 You will enjoy wonderful wine tastings at 3 wonderful locations. Our ending location is a perfect place for a little more wine and dessert and a great way to show off your wonderful purchases to your new friends! This tour is available for guests 21 years of age or older. Sorry, we cannot take anyone under the age of 21 on this tour unless you book a private tour. Please call 904-392-7137 to set this up. Please be prepared to show proof of age at each establishment if under the age of 35. An engaging, informative and interactive tour provided by one of our fun and personable guides that are fully licensed by the city of St. Augustine and will become your own shopping expert. Wine and a delectable dessert at the end of your tour! to the Salvation Army? Click the Kettle!